What do your guests like? You don’t want to serve up burgers and chips if your guests are expecting a fancy formal dinner but equally there’s no point in paying for lobster if the majority of your guests would rather have steak. If your first course is quite sweet you should serve something spicy or peppery for your main. If you have a tomato based starter you then it would be good to offer a cream based sauce for your main course. Does it match your wedding? If you are having a vintage wedding, gourmet sausage and mash, or exotic plates of sushi won’t be particularly suitable but if you are having a modern trendy wedding reception, traditional roast meats might be a bit out of place. Do your guests have special diets? 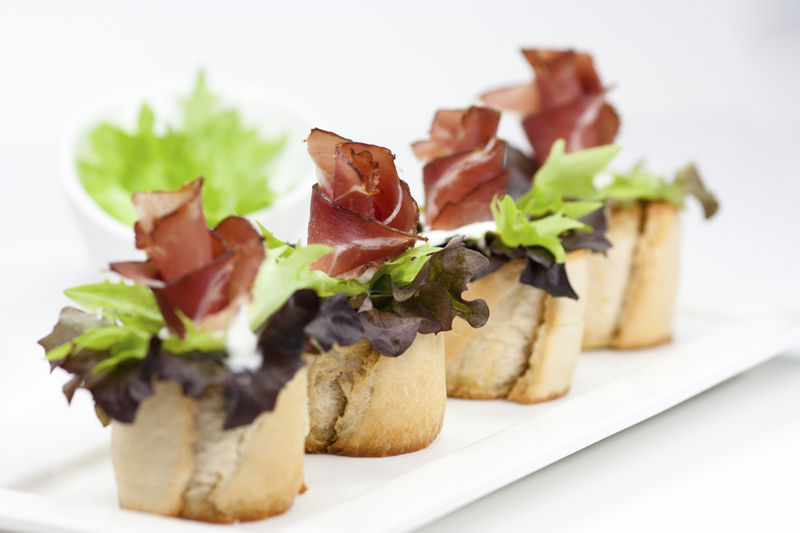 Wedding catering menus should have options or choices for those with special dietary requirements. You may also consider a fish dish and an alternative meat dish as a main course because a large number of people don’t eat fish but don’t necessarily list this as a dietary requirement. Will it make a mess? Your guests will all be wearing elegant outfits to your wedding so don’t choose a menu consisting of dishes that are likely to cause stains. Pheasant in a red wine sauce may be an absolute favourite of yours but will it remain your favourite once there’s a deep red stain on your wedding dress? Try to incorporate seasonal ingredients in your wedding catering menu; this should reduce cost as well as making the dishes suitable for the time of year. Choose menus that feature light refreshing dishes for the spring and summer months, and heavier richer flavours for autumn and winter weddings. Does it work with your wine? If you are serving a Sauvignon Blanc and a Pinot Noir, these will be suited for most canapés, a light first course such as a soup or cheese soufflé, and a fish based main course. Unless you plan on offering a different wine with every course, you might want to choose a menu where each dish works with one type of wine. Is it food you love? 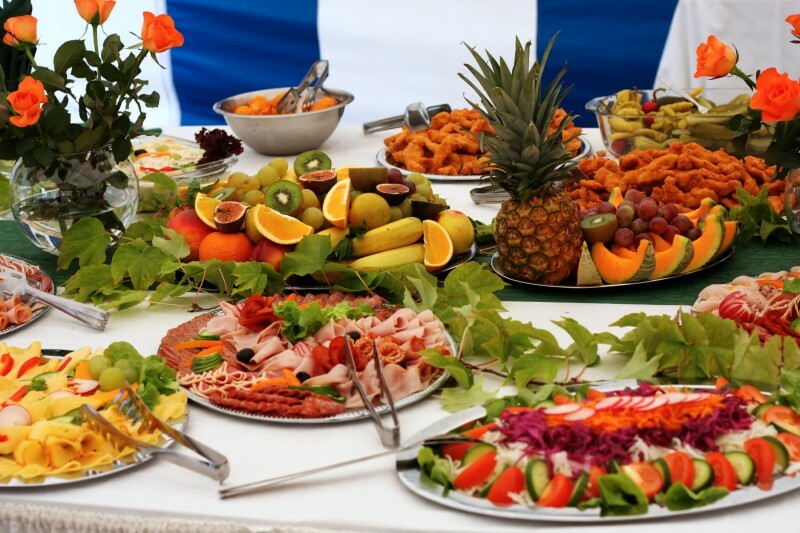 Each dish in your wedding catering menu should make your mouth water, so if your caterer doesn’t provide a set menu which lives up to that, get them to swap and change courses until you are completely satisfied. Many couples end up choosing a particular menu because they like the main course even if they’re not particularly excited about the rest. Most wedding catering menus are set on a price per head, so if you choose the menu at the top end of your budget you won’t be able to meet any unexpected costs that may arise. Leave some extra pennies in your wedding catering budget in case you have to accommodate a few extra guests at the last minute. If your first or main courses have heavy cream sauces, or feature pastry or cheese, try to serve up a dessert which is light and fruity. If you have your heart set on that opulent chocolate torte for dessert, offer a salad for the first course and light fish or poultry as main. Your guests may have built up an appetite after the ceremony, but they still have to get up and dance after the meal so you don’t want them to feel stuffed or dozing off during the speeches.